Jewelsong was born on the beautiful NC Outer Banks on July 5 2002 at a Sufi retreat. 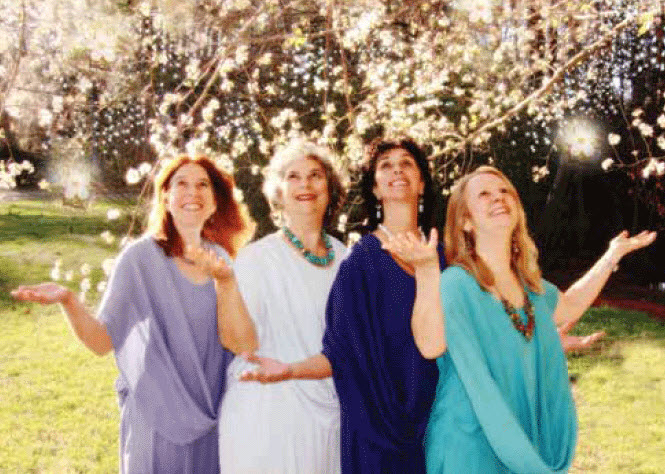 We emerged like Venus from the cosmic ocean of “The Beauty We Love,” a phrase from a poem by Sufi mystic Jelaluddin Rumi that is also the title of our first CD. Sofianna, Marilyn, and Farrunnissa sang the first Jewel Song, “100’s of Ways” by Tom Tracy and the Dead Poets, inspired by the same Rumi poem. Our first performances were effortless and creatively fulfilling, with the audience responding with gasps of awe and grins of delight. This has been the standard for all the songs we create and all the joy and inspiration we endeavor to share. Betsy joined Jewelsong about a year later, initially for 4-part harmony on her powerful song “Stand for Peace.” Our voices and styles clicked in a profound way, and we’ve continued singing together and creating new music together ever since. We’ve all been vocal and instrumental musicians most of our lives, and the richness of our backgrounds is a never-ending source of shared creativity and innovation. New songs are constantly flowing from the Muse, inspired by the different spiritual traditions, by the beauty of Nature, by the sacred trust of caring for the Earth, and by the Dance of Universal Peace, sacred writings, other songwriters, life, and our own imaginations and insights. Jewelsong is dedicated to expressing The Beauty We Love through our music, as in everything we do. We are grateful for the gift of our music, and are honored to share it with you.